Besides Btrfs, native Linux-based storage solutions have lagged behind the robustness and features of ZFS and the BSDs. Recently Red Hat acquired Permabit which provides an Open Source device-mapper Linux kernel driver and layer that sits between block devices and filesystems providing deduplication, compression and thin provisioning. Here’s my first experiences setting it up and initial returns using it. 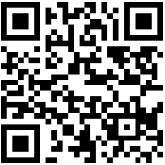 VDO stands for Virtual Data Optimizer. It’s a Linux device-mapper driver that provides innate storage capabilities to underlying block devices like deduplication, compression and thin-provisioning. There’s only a few elements to VDO: kernel drivers and some user-space tools. vdo, vdostats tools: these tools help you manage VDO volumes or display information and statistics about usage and block devices, metadata. 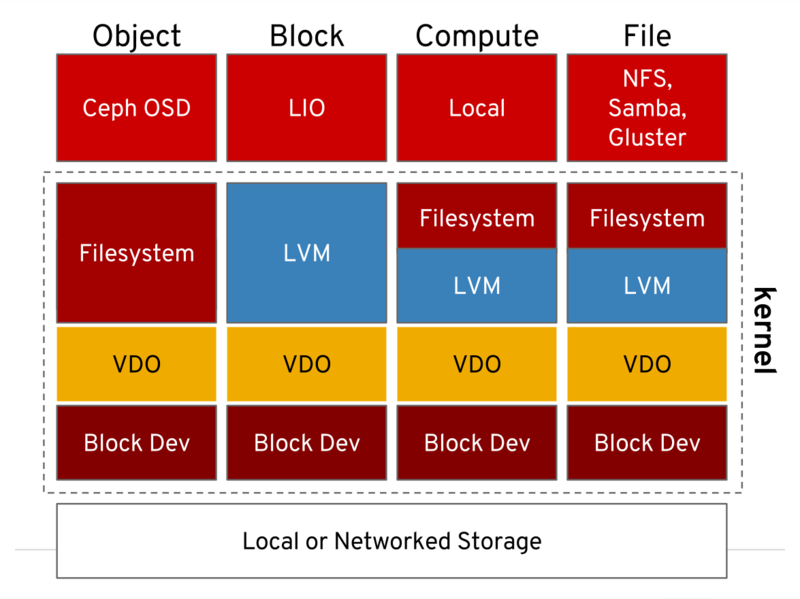 VDO sits at the device-mapper layer, above block devices but below the filesystem. For the graphically inclined here’s a diagram. e.g. our 33TB RAID6 volume below would require at minimum 8.63GB of memory. 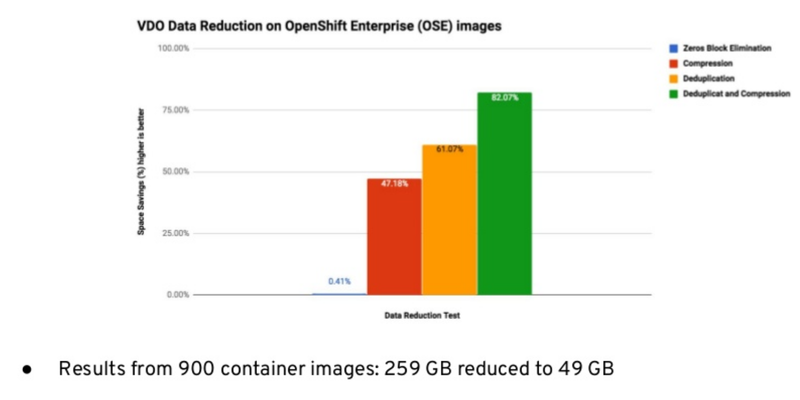 These measurements are much more conservative than ZFS in general, though ZFS does a little more like COW snapshots. Let’s jump right into installation. VDO Permabit kernel modules, service and user-space tools are available inside the base repositories for CentOS7.4 or RHEL7.4 or higher. Now you’re ready to create some volumes, in our case we’re going to create a thin-provisioned volume on top of an nVME disk. Above, this will create a VDO volume named vdo_NVME on our chosen device. Our actual physical disk size is 845Gb so we’re going to thin-provision roughly 6x to 5T. At this point just create a filesystem, mount it somewhere and start using it. I chose the async write policy here for performance reasons, but you should read the following descriptions to pick what’s right for you. sync – writes to the VDO device are acknowledged when the storage has written the data permanently. async – writes are acknowledged before being written to storage. In this mode, VDO is also obeying flush requests from the layers above. Even in async mode it can safely deal with your data, this is equivalent to other devices with volatile write back caches. This is the right mode if your storage itself is reporting writes as ‘done’ when they are not guaranteed to be written. auto – this is now the default, which selects async or sync write policy based on the capabilities of the underlying storage. You can read more in the documentation here. Creating large volumes may need adjustment of the Slab Size variable. A Slab is how VDO physically divides contiguous regions of block storage (think of it like LVM extents). The default slab size is 2G but they can be any power of 2, multiple of 128 MB up to 32 GB. When using 32 GB slabs, the maximum allowed physical storage is 256 TB but in our example we’re going to use an existing 33TB RAID6 MDADM volume. Now we can proceed with re-purposing this as a VDO volume first, but we’ll need –force since we’re leaving the mdadm device intact (though we’ll reformat it later). Next, we’re going to need to reformat the filesystem because VDO sits below the filesystem layer but above the physical block device layer. Note that this wipes all data on the previously used raw /dev/md3 device that was formatted as XFS. You can use the vdostats user-space tool to view details on your VDO volumes, including savings and a slew of other metadata, stats and other information. After a week of copying VM backups (qcow2 images, sparse files) to our vdo_public volume we see a savings rate of around 41%. Let’s compare that with a regular df (disk free) output. 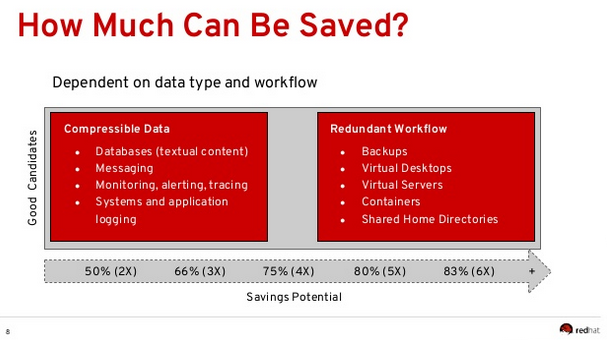 Also note df reports 300TB, 10x our physical space due to thin provisioning. As I start to store different types of data I will update this blog post to reflect. While I’ve only been using VDO-backed storage for mostly scratch space and VM image backups there’s some interesting data available about the types of savings yield you can expect depending on your data. The following were taken from a presentation on VDO at the Gluster Summit in 2017. I’ve only been running VDO on my two volumes for a few weeks now but in general these are my observations on a SuperMicro 6029P-TRT. My first thoughts were “Wow, this is great. I can also just yum install it without a bunch of hoops.” I was pretty excited about the initial returns as well. I also expected some rather demanding system utilization as I was used to deploying and managing ZFS-based storage like FreeNAS or just regular ZFS on top of FreeBSD. What’s lacking is here is COW snapshot functionality but I’m sure that’s on the roadmap. I’ll be keeping this updated as I experiment more, and also look forward to reporting some best practices on tuning and internals once I learn what they are. I also want to test out the replication functionality once I get another system stood up. Here’s the link to the official vdo storage documentation which explains a lot more than this post does currently. This entry was posted in open source, sysadmin and tagged centos, container storage deduplication, dedupe compression on linux, how to setup vdo on centos, linux, linux admin, linux storage compression, linux storage dedupe, Permabit, RHEL, storage, VDO on CentOS, VDO on RHEL. Bookmark the permalink. Hi there, I have created 2 vdo devices (/dev/mapper/vdo1, /dev/mapper/vdo2) on 2 physical devices (/dev/sdc, /dev/sdd). created Logical Volume(vdo_lvm) on 2 vdo devices. Now my system crashed and reinstalled OS. Can anyone know how to recover data from logical volume (vdo_lvm) ? in my case i’m unable to find vdo devices, vgexport, no data.